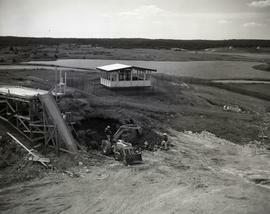 Item is a photograph of the excavations of the Glacis, facing South. Item is a photograph of the Glacis, facing South West. Item is a photograph of the excavations of the Glacis, facing South West. Item is a photograph of Perry, Scott, and Mrs. Scott, on the left face Glacis. Item is a photograph of the right face Glacis trench D1. Item is a photograph of a photograph of the Southeast face of Trench A. Item is a photograph of a photograph of a general view of Trench A. Item is a photograph of the transverse of Trench B. 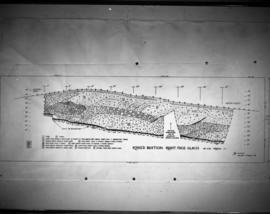 Item is a photograph of a photograph of a Southeast view of Trench E1. Item is a photograph of a photograph of detail on the Southeast face of Trench E2. Item is a photograph of the Northwest wall of SQ 2 and trench. Item is a photograph of the West face of the East half of Trench G.